It’s great like what you see here. I also give up my previous theme and switch to the new one: twentyten, the default theme of WordPress 3.0 that is used to be Kubric. 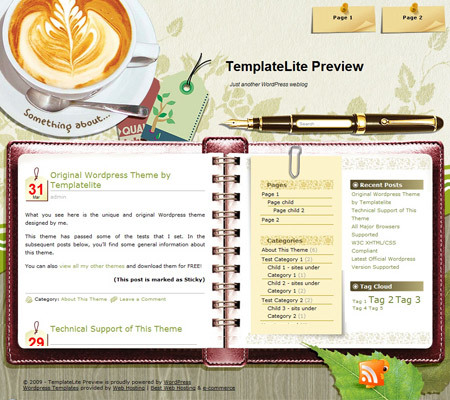 I expect this version make my blogging easier, lighter, friendlier, and more freedom. Even though there are a lot of social networks out there, blog cannot be replaced since only blog gives you the true pleasure of writing. Plurk is cool, Facebook is cool, twitter is cool, but who can deny that blog is designed to writing stuff? Nah, ini yang saya alami saat mencoba upload foto-foto untuk artikel jurnal prajabatan. Firefox berhenti bekerja ketika Media Uploader WordPress saya buka. Setelah pusing tujuh keliling saya temukan solusinya di forum wordpress. Intinya: matikan (disable) add-on Google Gear firefox Anda! I do like the paper theme by Amanda Hawkins. But I got a little problem here: the parantheis and the frame-box on the top of sidebar do not appear when I open with Firefox, but they appear when I open with Internet Explorer. I have checked from many PC and asked some friends to check it out and all gives the same result: something does not work perfectly. Of course you suspect it comes from the tags in php script or something, so I checked it several times until my eyes wet. The problem probably comes from my side, since you can enjoy the correct theme in its original source or in Gab-blog. Sedikit pamer, saya pos artikel ini saat istirahat di tengah kesibukan saya mewasiti olimpiade matematika SMP yang diadakan oleh Sekolah Alam Insan Mulia Surabaya. Apa yang dipamerkan? Apa lagi kalau bukan akses internet telkomsel flash saya yang baru, he he he.